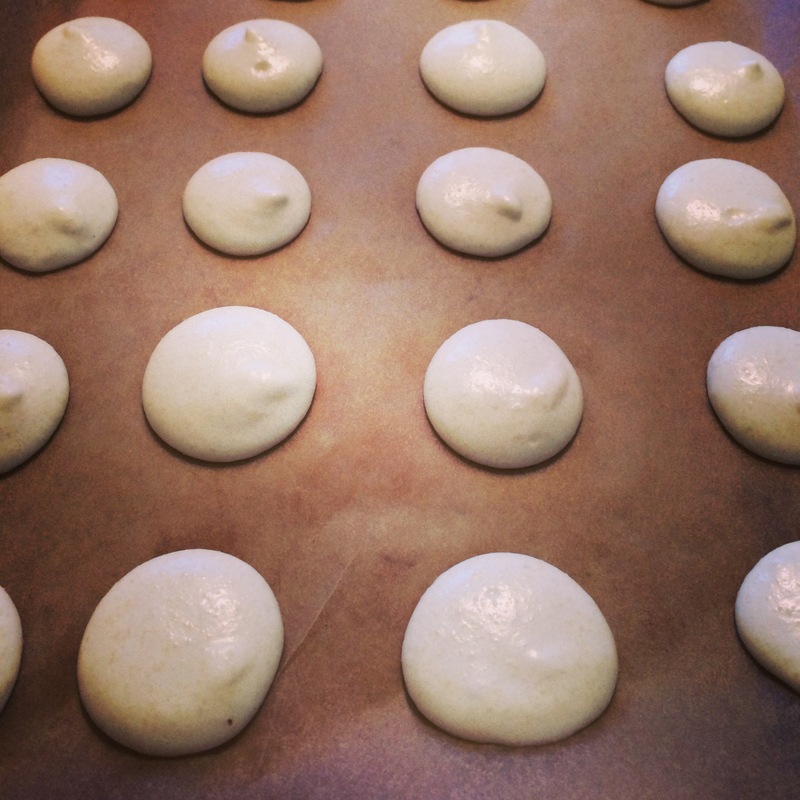 I blame Katherine, really – but how was I supposed to resist day after day of gorgeous macaron posts? So I decided to give them a try. It was easy to measure everything out but the easiest thing to do it with is a little kitchen scale. We have one of these and it was a piece of cake to do. 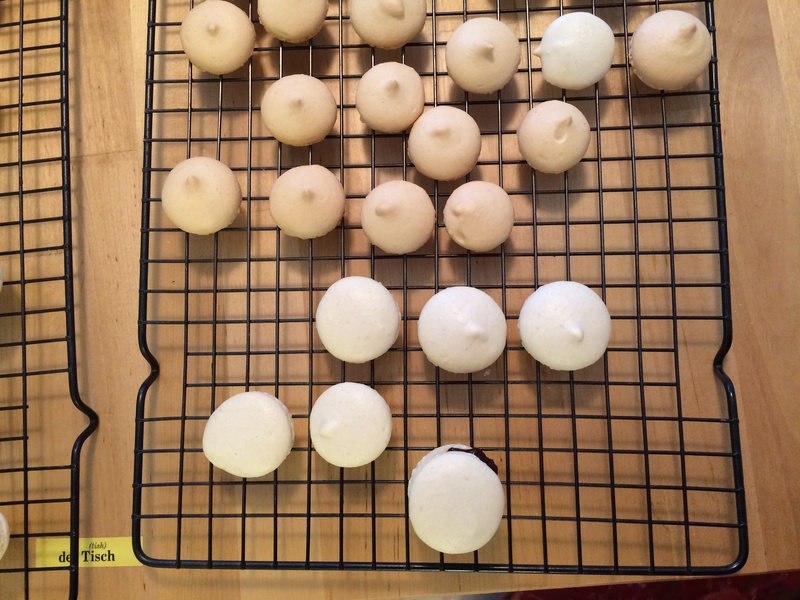 Also, the chocolate macaron recipe uses celcius for their temperatures. I didn’t catch this. So attempt 1, total failure. But I learned some things. 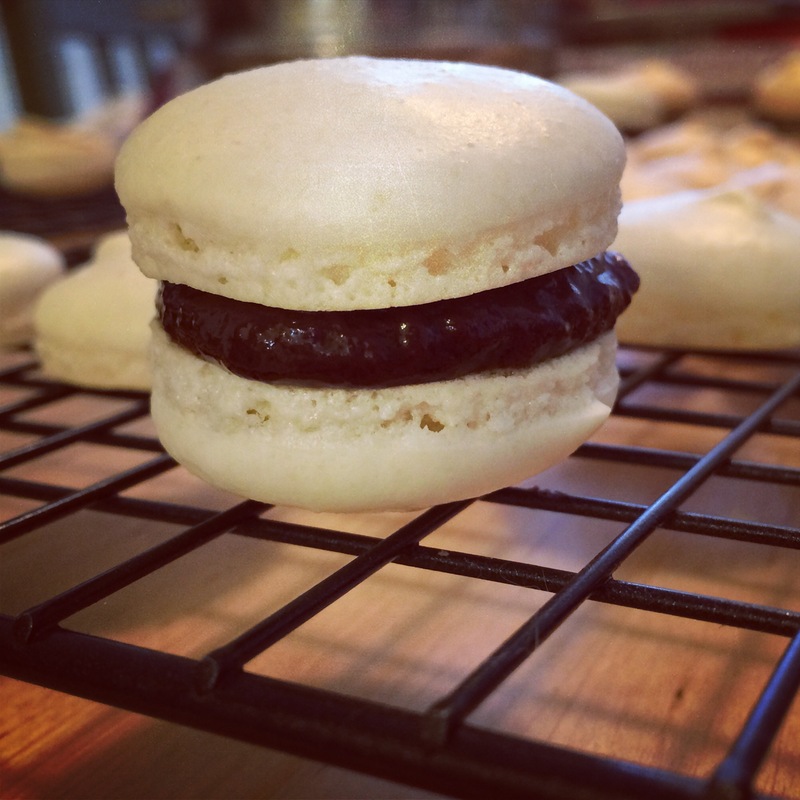 2) Attempt #2, chocolate macarons with ganache filling. They say “the right tools make the job easier and the wrong tools make the job so much harder.” I used the only pastry bag and tips I had which were WAY too small. It hurt my hands to squeeze the batter through the tiny tip and the shells did not look great as a result. Also the shells had feet. BUT they tasted really good even if they looked ugly. The ganache was surprisingly VERY easy. 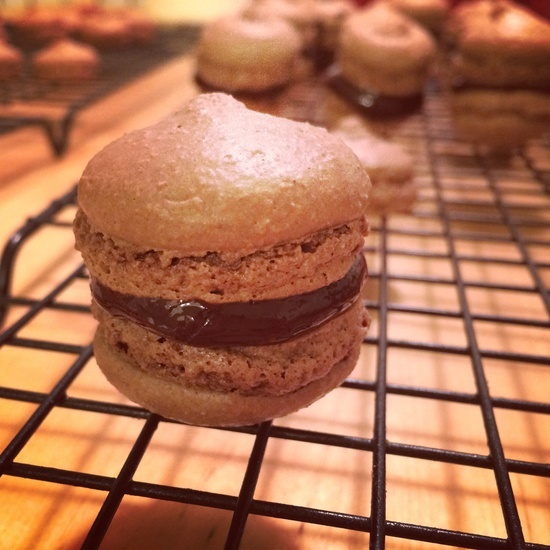 3) Attempt #3, chocolate macarons. I bought this: http://www.amazon.com/gp/product/B000BVFYU4/ref=oh_details_o06_s00_i00?ie=UTF8&psc=1 – A 1/2″ tip and bigger pastry bag. OMG, what a difference. It’s super easy to pipe them now and it doesn’t hurt my hands and it’s really fast. Worth the 10 bucks or whatever. Do not waste your time using the wrong size tip. This batch went much better as a result, though most of them still had feet. After reading more blogs, I think I really was afraid to over mix and was not folding the eggs and dry ingredients enough. I made fresh ganache and just mixed the leftover in and it all melted together just fine. I got one pretty shell though – so here is a picture. Despite most of the others having feet, they all tasted amazing. 4) Attempt #4, almond shells. Thought I was warned the chocolate batter was indeed thicker (and thus could have withstood way more folding than I did), I saw an immediate difference with this batter and I can already tell these will be prettier shells. The feet are already falling as they rest. I used this recipe as a guide for making them flavored, I used vanilla and almond extract in the egg white mixture. Also, I tried resting the eggs in advance this time. It just made the yolks break easier so I had to chuck one and use a cold egg to replace it. We’ll see if it makes a difference. I didn’t rest the eggs previously and other than not folding enough, I think it didn’t really make a big difference? I’m going to fill these with ganache as well. I’ll post a pic if they turn out well! ETA: one of the blogs suggested trying one pan rather than two. They did an empty pan on the top shelf and one pan on the bottom shelf. I didn’t have an empty pan, but I put one pan on the bottom shelf on our pizza stone. They came out not burned, but browned. Next I did the two remaining pans and they came out perfect. So I think with my oven doing two pans works just fine. Also, I doubled the almond extract from that recipe I posted 1/2″ tsp vanilla extract and 1/2″ tsp almond. And I love the taste. If you want it less strong though, only use the 1/4″ tsp of almond the recipe calls for. Here’s what the batter mostly looked like as it rested before going in. And here’s the browned ones versus the not browned ones. 2 pans it is. I have 3, so my last one, I think I’ll try to put an empty pan in there since it really does work best for me with two pans. Overall, I didn’t think this was that difficult a thing to make – sure to get them bakery perfect, it takes skill and practice, but just to get them tasting good, it was way easier than I expected them to be. Here again are links to look at.